Solange Knowles at a New York Fashion Week event on Sept. 8, 2016, in New York City. 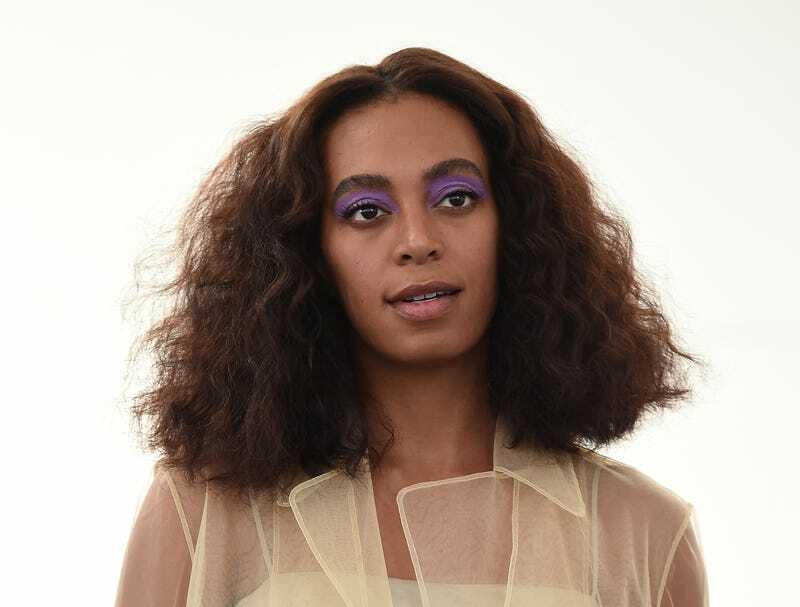 On Friday evening, after an evening out with her husband and 11-year-old son, Solange Knowles went on a tweet storm about how she was treated at a Kraftwerk concert in New Orleans. Knowles recounted how she was harassed by four white woman, and why black people never feel safe in white spaces. "4 older white women yell to me from behind, 'Sit down now'. I tell them I'm dancing at a concert. They yell, 'u need to sit down now,’" Knowles posted on Twitter in a now-deleted tweet. "We are at an ELECTRONIC and DANCE music concert and you are telling…not asking me…to sit down. In front of my child," Knowles continued. She then went on to say that one of the women threw something at her back. On Sunday, Solange wrote an essay titled, “And Do You Belong? I Do" on her personal website. She went into more details about the incident and how she commonly feels uncomfortable during certain events. You were planning on sitting down after this song, as long as it wasn’t one of the four songs that you really connect with and plan on getting down to. You feel something heavy hit you on the back of your shoulder, but consider that you are imagining things because well….certainly a stranger would not have the audacity. Moments later, you feel something again, this time smaller, less heavy, and your son and his friend tell you those ladies just hit you with a lime. You look down only to see the half eaten lime on the ground below you. You inhale deeply. Your husband calmly asks the group of women did they just throw trash at you. One woman says, “I just want to make it clear, I was not the one who yelled those horrible, nasty, things at you.” Loud enough for you to hear. This leads you to believe they were saying things way worse than what you heard, but you are not surprised at that part one bit. You’re full of passion and shock, so you share this story on Twitter, hands shaking, because you actually want these women to face accountability in some kind of way. You know that you cannot speak to them with out it escalating because they have no respect for you or your son, and this will only end badly for you and feel it’s not worth getting the police involved. So, you are hoping they will hear you this way. You know when you share this that a part of the population is going to side with the women who threw trash at you. […] You constantly see the media having a hard time contextualizing black women and men as victims every day, even when it means losing their own lives. You do not care in that moment because you understand that many of your followers will understand and have been through this same type of thing many a times, and if it means them hearing you say it’s ok, you will rise again through out these moments, then it means something bigger to you. You realize that you never called these women racists, but people will continuously put those words in your mouth. What you did indeed say is, “This is why many black people are uncomfortable being in predominately white spaces,” and you still stand true to that. You can read the full piece on Knowles' website.